OH YES! ITS FINALLY BLOGGING TIME! Hey Everyone! AND WELCOME TO MY NEW BLOG, ANIMATED! After completing my Disney College Program, I decided it was time to say see you real soon to blogging. To my surprise, when I got back home I kept getting a lot of complements about my blog Bring On The Magic! Although it was mainly a blog to share experiences I had during the program, it turned into something a little more. Writing entries like character and quote of the week turned into one of my greatest focuses on the blog. I loved reading quotes and looking up the right character for a certain week! Those are also the two entries I’ve had the most complements on. I think Bring On The Magic served a little more than the purpose it made for. What was suppose to be a blog about mainly the DCP turned into to a way I could connect with those on the program, back home, and even people I don’t know. It was a way for not only people to get to know me better, but also for me to get to know myself better. So with that I decided it was time to get back to blogging! Bring On The Magic will always be the blog about the Disney College Program and I want it to stay that way! After a bit of time thinking about what my new blog would be about, I re-read my final post on Bring On The Magic before my farewell post. It was about what my top 10 favorite animated characters had taught me. This was probably my favorite entry to write up! That’s pretty much where the idea of animated was born! I wanted to welcome not only Disney characters, but also characters from all different types of animations! Thus my new blog animated was made! AND I AM SUPER EXCITED! SO, what’s in store on the new blog animated? Here is a dose of the great world of animation that awaits to be written and explored here on animated! Hello there! 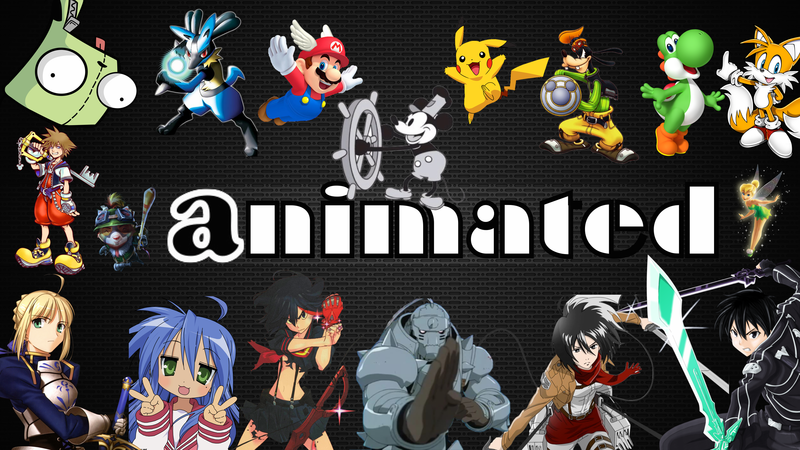 Welcome to animated! A place that is meant to celebrate all things animated! One of the great things about following animated is you never know what topics to expect! It can range anywhere from talking smash bros, to new Disney movie news, to recently watch animes, recently played video game reviews, books for recommendation, places to go, Cons to visit, and much much more! I hope animated serves as a place where people and characters of all kinds can come to share in their love for any types of animation they may love! Even if I don’t know about, for example a certain anime you like, feel free to recommend it to me! I’d love to hear recommendations of things to watch and play! In the end I want this to be a a great community that greets any and all types of characters! WordPress articles and YouTube videos will be posted onto the animated’s Twitter account. However, I will use Twitter as well to get across short fields of information that I may of just heard of or small info on some rumors. I also want to say that if you are one of the first 100 followers on Twitter, you will get a permanent follow-back. So if by an amazing feat this blog one day has one million subscribers, the first 100 followers on Twitter and Youtube will always have animated following them. It is a way to say thank you to those who gave animated a chance! YouTube will mostly be used for special posts that usually have a complication or AMV (anime music video) attached to them! I’m still in the process of determining whether I’ll do Let’s Plays, however, I hope I get to! That would be awesome! If Let’s Plays do arrive they will be posted on YouTube, while shared onto WordPress and Twitter! Lastly, if you guys enjoy anything from a blog post, to a complication video, to a random twitter post let me know with a like or comment! It lets me know what you guys want to see more of and what doesn’t sit well with the community! If you guys also enjoy animated, follow and subscribe on WordPress, YouTube, and/or Twitter! I hope it can grow into a large community! However, big or small, this community will always be amazing! Thanks for the nomination! 😀 Going to start it tomorrow! I am going to pile more award nominations on you. Also to make this comment more entertaining. Here is a song: Yellowcard’s Ocean Avenue. You’re welcome. Glad you like the song. Thank you for the nomination! 😀 I’ll get to it as soon as I can! interested to see the top 10 things that makes you happy. Thank you so much! 😀 Sorry I’m a little behind on award posts but I’ll get to it as soon as I can! Your welcome and no prob there’s no rush take all the time you need to make awesomeness happen. haha, another one for ya xD ,I pick you for the Versatile Blogger Award! Thank you for the nomination! I’ll get to it! I nominate you for this blog award, the sunshine blogger award! You’re welcome. I thought you might like it.